Last night, Trevor had a friend over so I set up my Big Green Egg as a convection oven (plate setter in, legs down) and made a baked ziti. Of course, you could make this in your oven but you know I like playing with fire. is durable - some of these pieces are 8+ years old. I have only ever had one piece break and that was 100% my fault. Our "set" is a mixed breed of Food Network (brand formerly available through Kohl's) and the other half is the Family Heritage Classics Collection from Pampered Chef. I can't find the Food Network line available anymore but I know the Pampered Chef is still available. I prefer the non-glazed style. The glazed and/or enamel ones are pretty but cooking on a live fire grill is going to stain them eventually. 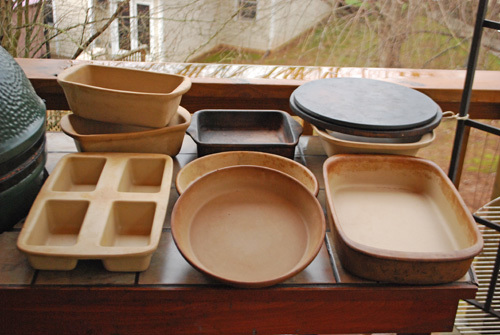 Here are some tips from Pampered Chef for caring for your stoneware. Back to the ziti. Most baked ziti dishes I have had are tomato based but I thought I'd use a spicy, cheesy white sauce. 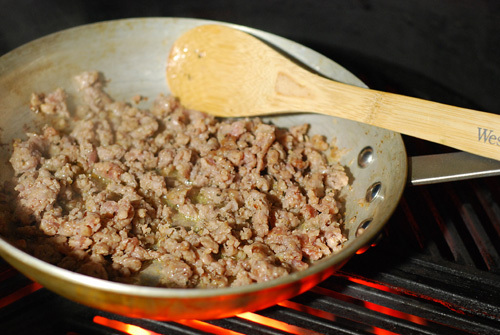 Preheat a grill safe pan over a medium hot grill. Add a teaspoon of high temp oil (refined canola, peanut, etc) and brown the Italian sausage, about 5 minutes or so. Remove to a collander. 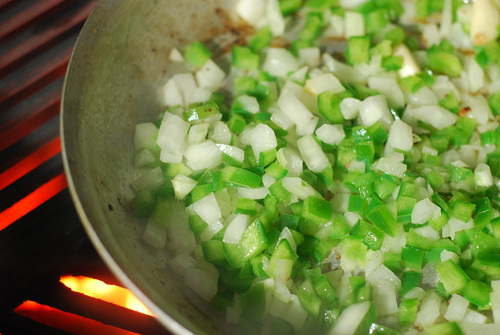 Add another splash of oil to the pan and saute the peppers, onion and garlic until tender, about 5-8 minutes. Remove and when slightly cool, mince the cooked garlic. Preheat a pan over medium heat. Add butter, melt and whisk in flour just long enough to form a blonde roux. Add the milk, in small batches (1/4 cup) at first, whisking continuously until fully blended. Add the seasonings and bring to a slight simmer. Cook until thickened, whisking occasionally, about 10 minutes. 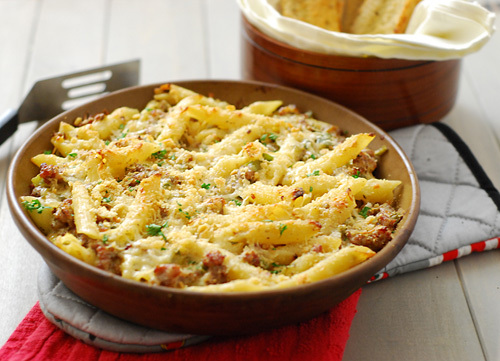 Stir in 1/2 cup of Pecorino-Romano and 1/2 cup of colby-jack cheese in batches until melted. Remove the bay leaf. 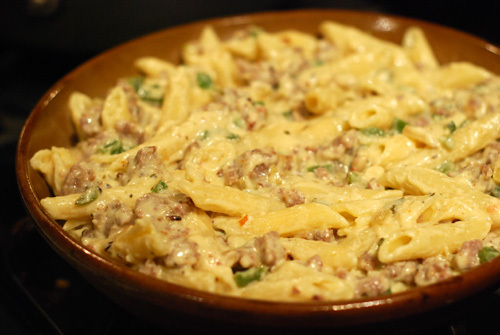 Mix together with the meat, cooked pasta, and veggies, tossing thoroughly. Pour into a lightly greased pie pan or 8x8 casserole dish. Cover with foil and cook for 30 minutes at 400f. Remove foil, top with crumbs and remaining cheese and bake uncovered for 15 more minutes. Brown the meat in two batches if you have to, don't overcrowd the pan or the meat will steam instead of brown. There is nothing like the smell of peppers and onions cooking outside on a grill. 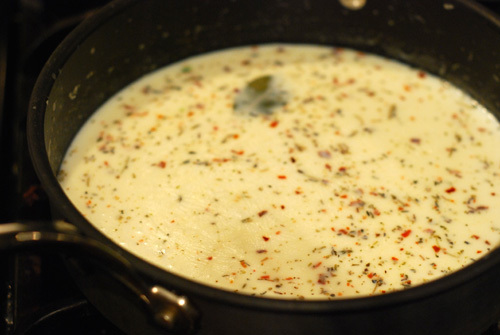 At first, the white sauce will SEEM like it won't thicken. When you see "film" try to form like this between whisks, it is just 2-3 minutes from thickening. Ready to be foiled and put on the grill (or oven). 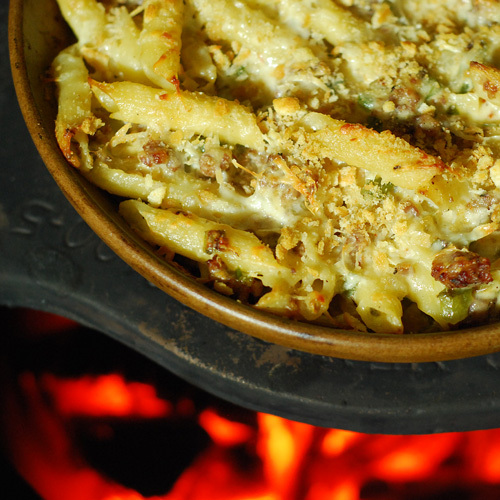 Fire baked pasta - mmmmmmmmm. Crispy on top, creamy in the middle. Yep, I used hot dog buns for garlic bread. I didn't have any French or Italian bread and saw a few hot dog buns in the bread pantry. It works for me. Would you please share what you did to explode your stoneware on your BGE? I would like to avoid it, and I would like to learn from your mistake, if you are willing to share! I was cooking something in a stoneware pie plate and it was running a little hot and the drippings were starting to burn. I had just opened a cold beer and absentmindedly thought that I would just add a little to keep them from burning. As soon as the cold liquid hit the hot stoneware, there was a very distinctive "KLINK" and the stoneware split into three pieces. I knew better, I just wasn't thinking. My wife is a consultant and I was wondering if I could use it on the grill and she checked into it. Pampered Chef doesn't recommend it. You have had good luck with it though. Do you only use it on your egg or have you used it on a regular grill over indirect heat? I think Pamperchef doesn't recommend using any direct heat on stoneware, grilling or otherwise. Most of the time I use my stoneware with indirect heat, whether on our Eggs or on a standard grill (yes, I do use these on other grills too http://www.nibblemethis.com/2011/05/bourbon-and-cherry-grilled-pork-chops.html). I have used some over direct heat at around 350-400f but that was about 6-8" from the coals, not super close, so there was some buffer there. I don't have a, what did you call it, a plate setter? If I took a cast iron griddle and set my casserole dish on top of that, it would serve the same purpose right? Yes, that would be a good substitution. Just make sure to place some kind of spacer between the cast iron and stoneware so you aren't getting more heat on the bottom than the top. 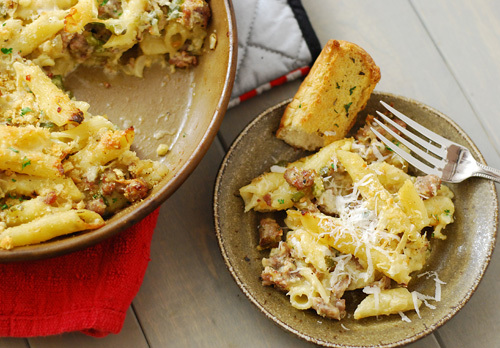 For more great sausage recipes (grilling and otherwise), check out Johnsonville's home page. [Standard Disclaimer] I have a relationship with Johnsonville but this is not a sponsored post. I have no relationship with Kohls or Pampered Chef.